It can be difficult as individuals to know what you can do to raise awareness about ME/CFS. Especially for those moderate to severe persons with ME/CFS and their carers. There’s a list of ideas on the What You Can Do page. I guess most people reading this have a blog or use a social media network like Facebook, Twitter or MySpace. 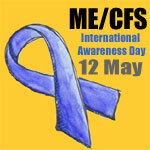 You could write a blog post especially for ME/CFS Awareness – either to post on International ME/CFS Awareness Day on 12 May or at any time through the month of May. Or use your status updates on social media networking sites to link to something you feel is relevant to raising awareness of this condition. You don’t have to have ME/CFS or care for someone with it. Anyone can join in. Help us spread the word. What you talk about is up to you. Personal experience, facts and figures, current research, a photo or piece of art about ME/CFS or simply linking to an article or organisation that can tell people more. Already our participants list is showing that you are not alone. If you intend to join in please do leave a comment on the participants page so we can add your name to our list.